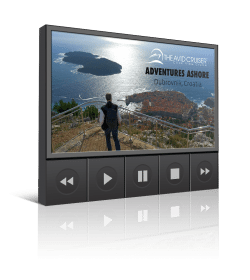 Holland America’s Maasdam is a staunch favorite among passengers. 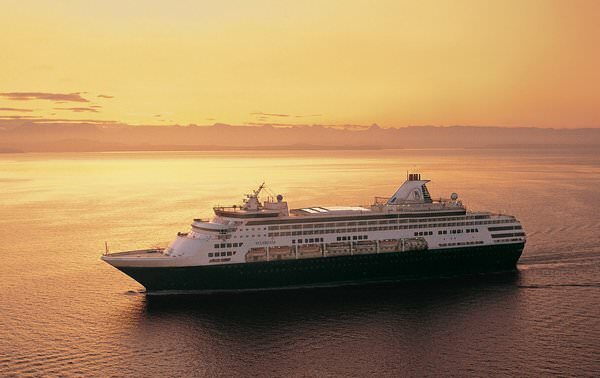 Photo courtesy of Holland America Line. This class of four handsome 1,266-passenger vessels built in the mid 1990s has the sharp look of a classic ocean liner, with a sweeping foredeck and lovely tired decks at the stern. 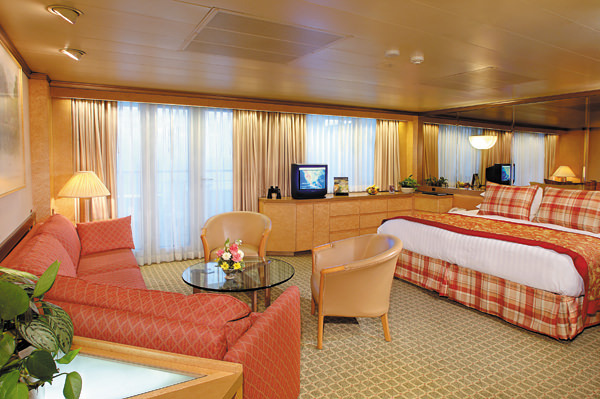 The Maasdam is spacious, yet intimate in size and has a lovely traditional feel without being stuffy. Like the rest of the fleet, HAL’s Signature of Excellence enhancements in recent years have kept the Maasdam and her sisters looking fresh and modern. Public spaces include the popular Explorations Café, a combo Internet center, coffee shop and well-stocked library. A row of comfy chaise longues connected with CD players and headphone stations face the sea through floor-to-ceiling windows, while other clusters of couches and chairs invite reading and resting. Evenings, options include the dimly lit and atmospheric piano bar; a new lounge called Mix for a great martini, glass of bubbly or anything else that tickles your taste buds. Dancers head to the Ocean Bar for its live band, while the Crow’s Nest nightclub up top becomes the ship’s disco at night. The ships’ two-story showrooms have cozy groupings of banquettes and movable chairs on the first level, a rare set up these days. A casino and small movie theater, that doubles as the Culinary Arts Center demo kitchen, round out the entertainment venues. 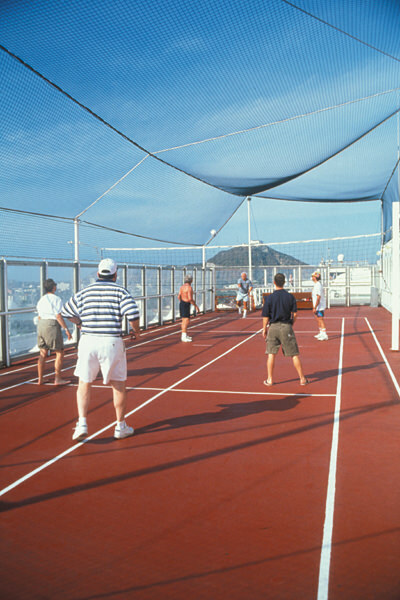 Exercisers will appreciate the roomy ocean view gyms and large aerobics area, plus the combo basketball/tennis/volleyball courts up on the Sports Deck. The redesigned Greenhouse Spas each sport thermal suites with a hydrotherapy whirlpool and heated tile loungers. 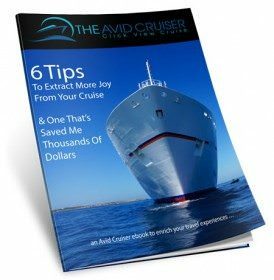 There are two pools, one with a sliding glass roof when cruising in cool climes like Alaska, and one aft with great views of the ship’s wake. When it comes to eating, choices include the elegant, two-story main dining room at the stern, with a pair of curved staircases sweeping down to the lower level for grand entrances. The Pinnacle Grill for steaks and seafood is much smaller and more intimate, while casual diners can always head for the indoor/outdoor buffet restaurant, complete with a taco station and burger grill; and evenings, a new Italian section called Canaletto. Roomy standard cabins are at least 185 square feet and feature super comfy bedding, plus a flatscreen TV and DVD player, makeup mirror, massage shower head and bathrobes. Outside cabins on the Lower Promenade Deck face the wraparound promenade deck, where walkers have great views of the sea (special reflective glass prevents outsiders from spying in).